Envy all those Hollywood starlets with a seemingly endless wardrobe and a staff of people that have them always looking camera ready? Let Iman be your personal fashion stylist with this 3-piece wardrobe set. 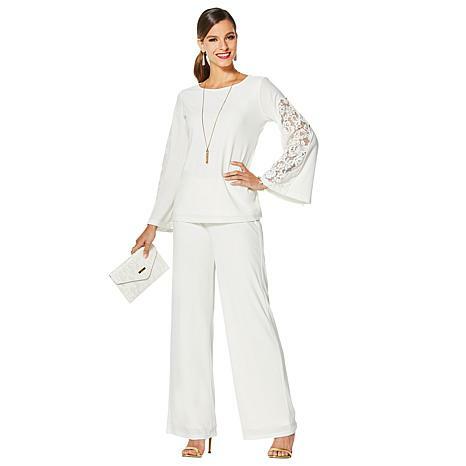 A figure-flattering palazzo pant, ultra-feminine lace-trim top and petite lace clutch give you fashionable options to mix-and-match all year through. Felt really chic wearing this! I have this in the black and wore it to church for Good Friday. The fit was nice and I felt nicely dressed without being over dressed. The material felt nice against my skin and was very comfortable to wear. I also have it in the burgundy but havent worn it yet. I expect the same results. The Iman pant suit I purchased fits true to size. I am very pleased with the quality of the material and it washes and dries without a wrinkle. Very proud I made the purchase! Ordered the blush and the color is subtle; very nice. I got the small based on the size chart and the pants are just a bit snug in the waist but the top fits great. It is a cute outfit though. Loved first one, ordered 2 more. 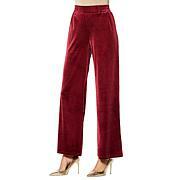 Great for Cruise formal nites, pants can be worn with other dressy tops. Not a fan of bag, can feel cardboard lining, feels cheap, added to my non essential Iman extras. 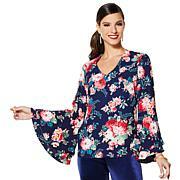 Price Drop soldme, love Iman! You deserve the finer things in life. Colleen Lopez fashions are made with incredible attention to detail and exudes pure femininity. For sophisticated designs that are perfect for any occasion — look no further than this extraordinary collection.